National self-determination was supposed to be the answer to the so-called “ethnic problem” of the 19th century. The prewar, multi-ethnic Russian, German, and Austro-Hungarian empires, all on the wrong side of history, had disappeared at the end of the First World War never to return. In their place would come relatively homogenous nation-states that would, in theory, reduce the ethnic tension that had undermined the stability of Central Europe and the Balkans. Once each nation possessed its own internationally-recognized borders and resources, Europeans should have a greater incentive to cooperate and fewer reasons to compete. These new nations had to identify what made them distinct and by what right they could claim a hold on the loyalties of the people who would live inside their artificial borders. The architects of new states like Ukraine, Poland, and Czechoslovakia needed symbols and identifiers. Usually these symbols were rural, recalling ancient common traditions like language, religion, cuisine, literature, and, above all, the importance of links to the land. Where did this process leave the Jews, few of whom shared these common cultural identifiers? The so-called “minorities” question perplexed the thinkers of 1919. Because the treaties that came out of the Paris Peace Conference changed borders but did not forcibly move people, minorities would end up living in all of the new states. What kind of future could they expect? The designers of the new world order of 1919 rejected an idea floated by American Jews like Louis Marshall to give the largest minorities their own voice in the League of Nations. Such a system would have been politically messy and might well have required the British to accept an Irish voice and, much to Woodrow Wilson’s horror, the United States to accept an African American or Asian one. Still, the essential problem remained: how to protect minorities in nation-states where their presence would make them stand out as aliens? The question did not get the attention that it should have. All of the constitutions of the new states made at least rhetorical promises to guarantee the rights of minorities. Wilson thought such constitutional guarantees would suffice; time soon proved him wrong. Some intellectuals in 1919 expected that each minority would benefit from a brother state to look after them. Ethnic Hungarians in Romania, for example, could always appeal to the Hungarian government to make their case for them in the League of Nations. Or, Poland could be expected to treat ethnic Ukrainians inside its borders well because it needed Ukraine to treat ethnic Poles well. This principle of reciprocity would ensure the reasonable treatment of minorities across the continent. The great exception, of course, was the Jews. They had no state to make a case on their behalf. The Jews of the United States sent money and did their best, but in the 1920s the American government took few concrete steps to slow the growing anti-Semitism in the new states. Immigration laws in 1921 and 1924 virtually closed the United States to Jewish immigration. Jews in France, Germany, Italy, and the United Kingdom sometimes sent help as well, but many feared that too close an identification with their Jewish brethren might call their own patriotism into question. Assimilated western Jews did not identify with the generally Yiddish-speaking and more Orthodox Jewish communities of the east. In Germany, home to a particularly well-assimilated Jewish community, the Jews nevertheless appeared as the last remaining minority. The Treaty of Versailles redrew Germany’s borders, in the process taking away most of the Poles and Alsatians who had lived there under the Kaiser’s empire. The Jews remained as the only large minority. They became an easy target for the new German Right. Anti-Semites and ultra-nationalists also associated Jews with the Bolshevik Revolution and the fears of communism that came with it. Jews, including Rosa Luxemburg in Germany and Béla Kun in Hungary, did hold positions of importance in several Communist movements. Jews, most notably Leon Trotsky, were also prominent in the new Soviet Union. Although many non-Jews were also communists and although most Jews did not support the Soviets, linking Jews and Bolshevism became an all-too simple calumny in 1920s Europe. The result was a wave of pogroms that targeted Jews as dangerous aliens in the new nation-states. In Poland and Ukraine, especially, accusations of blood libel and Jewish treachery against Christians fueled fears about Jewish threats to national ways of life. With no state willing to help and the British blocking most legal routes to Palestine, Jews found themselves trapped in new states that did not want to accept them into their national projects. The collapse of the international economy in 1929 marked a deadly turning point. With jobs at a premium, the new states moved to expel Jews from the civil service and ended what limited educational subsidies they had provided to Jewish schools. Anti-Semitic persecution and dehumanization followed as the rise of the Nazi party gave an imprimatur to official anti-Semitism and a model for other states to follow. The European Jews who survived the 1940s recognized the need to ensure that Jews would have a state of their own to protect their interests and to defend their people. By 1948 national self-determination would at long last apply to the Jews as well. Featured image credit: Europe map 1919. Public Domain via Wikimedia Commons. 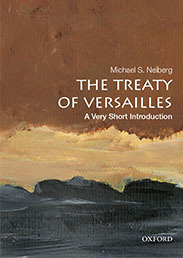 Michael Neiberg is Chair of War Studies in the Department of National Security and Strategy at the US Army War College in Carlisle, Pennsylvania. He is the author of many books on the First and Second World Wars, including The Path to War: How the First World War Created Modern America, The Blood of Free Men: The Liberation of Paris, 1944, and Dance of the Furies: Europe and the Outbreak of World War I. Michael will be speaking at the Center for Jewish History on 07 February as part of the Short Talks on Big Subjects series.